Imagine taking all of the data on a Blu-ray disk, adding 40 times more information and shrinking it down to the size of a dime. Imagine that disk having enough memory to record an entire human life. Sandipan Pramanik, a professor in the Department of Electrical and Computer Engineering, is developing a new way of storing memory that will dramatically alter entire industries. Pramanik's ambitious vision has won the first annual Disruptive Technology Challenge sponsored by TRLabs, a national high-tech research consortium based in Edmonton. Pramanik is researching what amounts to the Holy Grail of computer engineering-a universal memory circuit that will render static and dynamic random-access memory used in PCs and laptop computers as well as hard disc drives, compact discs and flash memory, obsolete. Using present technology, selecting one of these types of memory systems always involves a trade off in speed, cost, storage density, power consumption and durability or volatility, says Pramanik. Pramanik is taking a unique approach to the problem, applying nanotechnology and spintronics. Simply put, Pramanik is fastening carbon nanotubes onto a pitted surface. The electrical resistance of each nanotube-weak or strong, represents a "zero" or "one" as a single bit of information. 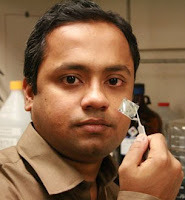 Because he is working at the nanoscale, Pramanik's memory circuit can be shrunk to unprecedented levels. Pramanik envisions a single universal memory chip with a storage capacity of 1,000 gigabytes in an area of one square centimetre, compared to approximately 25 gigabytes for a Blu-ray disc (and 5 gigabytes for a normal DVD) that typically occupies 100 square centimetres. The Disruptive Technology Challenge is designed to nurture information and communications technology innovation that has the potential to disrupt or create markets, disrupt current thinking in a field, or provoke new avenues of research with strong commercialization potential. The award Pramanik received will help fund three PhD student scholarships for three years. Pramanik said winning the award is an honour. "It is really great. This project has several technological challenges, and this award enables us to assemble a team of researchers, build the necessary infrastructure, and address these problems in a systematic manner," he said. "At present we are anticipating hiring three PhD students." Pramanik is optimistic about reaching his goals. There are challenges "but we have plans on how to tackle those issues, and if everything goes well we are hoping to develop a prototype by the end of this funding period."